There are moments in life that become a scar. Moments of tragedy that do not leave you. Moments that have the ability to alter the course of your life from their moment of impact. A moment in time that consumes every part of you – mind, body, and soul. A moment where you can lose someone, and a moment where you too can lose yourself. These moments will forever be a part of you; they can defeat you, or they can spark a fire inside of you. Or they can leave you floating somewhere in between – being tugged from side to side. This moment shaped my life more than any before or after has. This moment has made me hyper-aware of grief, of loving and losing, and most of all, of the crushing power of mental illness. Some days I feel like a shell of my former self. The torture of that moment had me on my knees, seconds from breaking beyond repair. And from there, I had to build myself back – piece by piece. It all started when I saw those flashing lights. When our relationship had run its course and we went our separate ways, the last thing I expected was a text two weeks later from you. Your life had beaten you down, again, and the darkness had set in. 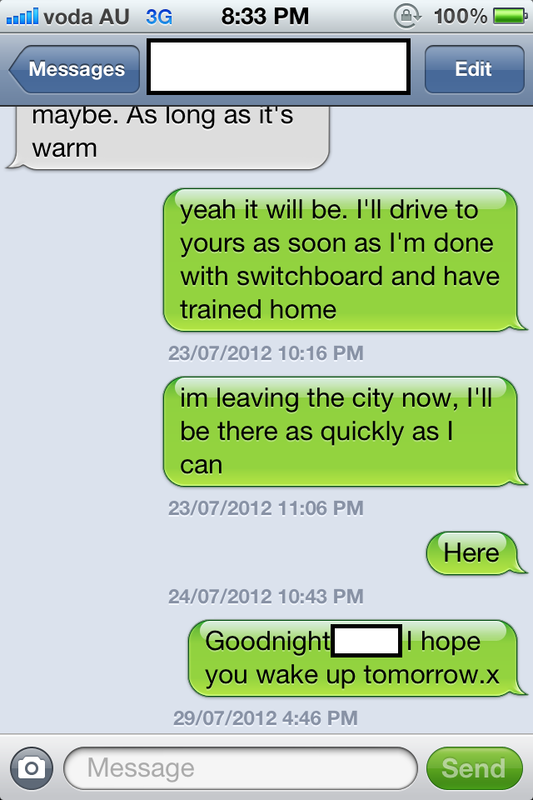 Going from one workplace in St Kilda to another in the centre of Melbourne, our texts back and forth seemed harmless enough, you were upset and we were talking it through. I knew how fragile you could be, and how you could react. Text sent, text received. Nothing out of the ordinary. Then you reached your breaking point and began unravelling before my eyes; your words became darker, then less coherent. The pit in my stomach began to deepen, then churn. With two hours of work separating us, my anxieties grew by the minute. A feeling of constant, consuming dread surrounded me. My mind jumped from scenarios that got worse and worse – but never did I expect the worst to come true. Waiting for a train home at Flinders Street station, my mind and my heart were racing. Your contact became spaced further and further apart. When my train was delayed I knew I couldn’t wait any longer and took a taxi straight home. I’d get there, get in my car and get to you. As the panic set in, it was as if life had tied a bungee cord around my waist and was holding me back from you as I crawled on my hands and knees, fingers trying to grip the dirt just to inch forward. My car was out of petrol. I ran inside to borrow another, and life tightened its grip, my parents wanted to know where I was going and what the problem was, the best I could muster was a cruel “he’s going to f***ing die if I don’t leave now!”. I don’t know what made me say that. All I knew was that I could see a clock ticking down the minutes of your life in a race I couldn’t win. Every red light on my way to you was a dagger in my gut. Fear clouding every thought in my head. Running up your street to your driveway I knew that I had lost. The flashing lights were already there. And I could see you there in your footy shorts, they wheeled you in, shut the doors, and drove away. And there I was, both empty and overflowing with shock and all-consuming fear. Your mother took my hand, I couldn’t stop shaking – nor string much of a legible sentence together. That was the first time I met her. The next six hours was a blur of racing home, then to the hospital of crowded triages, of burning artificial lights, of whirring and beeping machines, of ICU nurses and patients. Then the lights were dimmed, it was just me and you. Then just me, trying to sleep in the eerily silent waiting room, alone. Over those next few days my mind was nowhere else but with you. Willing you to wake up. Just so I could hug you. I wanted so badly for you to be ok, but I hated that I felt this way. I was mad, embarrassed and scared that you had made me so vulnerable. I didn’t want to feel so bare, so small, and so helpless to the horrors life had thrown. Seeing you there – lifeless and still, in a room filled with beeping and whirring, with doctors and nurses, the noise was drowned out by a fog of unshifting despair and sadness. It was like the thoughts and darkness that had consumed and haunted you thought that they had won and so they latched themselves onto the only living thing left in that room – me. I wanted to be next to you forever so badly that I didn’t notice that my guard was down, and that I was crumbling. I had been changed beyond repair. Something left me that day, that hasn’t returned since. The rapid changing and severity of emotions that battered and bruised me in that room more than two years ago haven’t left me – and they still wield the same power they did back then. It was when you woke that I thought I would be healed. I didn’t think it would get worse. After years of knowing you, and three days of waiting, I saw the real you for the very first time when you first awoke. It was like two raw, battered spirits were meeting for the first time when you hugged me. We were both broken fragments, delirious and weak. “I’m sorry”, you said, and we were a wreck together. I don’t know what I thought was going to happen now that the ‘worst part’ was over and you were awake – but I assumed it would get easier. But visiting you two days later, in the ward you had moved into from the ICU, I knew that the battle had already begun in my head. I could see you, but there was already a change creeping across. Your mask was back on. You wanted everything to be ‘fine’ so you acted like nothing was wrong. But now that I had seen what lay beneath the face I knew, behind the mask, I realised how much I wanted that you, and nothing less. The wall was up, and you weren’t letting me in. I wanted to help you, to be the saviour that would get you past this, and never let you feel like that again. I mistook the feelings of caring for something more, and fell for you all over again. The whirlpool of emotions began to spin faster. I feared for you. I cared for you. I was broken. You were broken. We weren’t meant for each other. I wanted to be the one to shield you from the ruthless world outside of the hospital walls. To keep an eye on you every second of every day – saving you from yourself. That’s when reality reared its head. We had obviously left each other for a reason. Would we – two broken pieces – just break each other more the longer we were together? No one could save you but yourself. And I had to give you the best shot to do that. And so when I left your side that day, I left you. But closing the door on something doesn’t mean the emotions are locked out forever. The daily battle is real, and seemingly unshifting. Some days you are my motivation, to fight for these situations to be tackled head on, to stop the pain of suicide infecting families the world round. To be a part of the community we all play a pivotal role in, in giving and spreading nothing but love and happiness, to create a world where each of us has a place, a friend, and a drive to fight on every day. But every light has its darkness. With the good we have the bad. And in those days I feel like a pinball – thrown about, crashing into different emotions by an unseen force. Guilt. Have I done the right thing? I did what we both wanted, but should I have stayed there by your side? Why does it matter what I’m feeling, when you were the one lifeless in that bed? Did I abandon you? Despair. What kind of world do we live in when there is pain this real? How can there be people and things that want us to crumble and drown in the pain and hatred that becomes all-consuming? Can any of us be saved from this? Vulnerability. What makes us feel this much? Are we weaker than those who don’t feel this much? Anger. Why does this happen? Why were you driven to this point? Why does a family have to even consider that they may lose their eldest son? Why did I have to be plucked from innocence into this mess? Fear. What happens if I, or someone else that I love, falls down the rabbit hole that you did? Am I strong enough to go through this again? What if it’s me? My life will never be the same again, I have changed, and so, my day to day has changed too. The rapid heartbeat and sweat that comes with thinking about you or seeing that hospital. In a cruel twist of fate, for almost six months after I thought I’d lose you I had to drive past that hospital every day on my way to work. I used to close my eyes, then I could use my hand as a shield to keep it from my vision. Now I can see it, and the way it affects me changes each time. I can mask my emotions, distract myself from how it makes me feel, but I will always have that pit in my stomach. Fear, dread and sadness. My relationship with alcohol became rocky. With each drink came either a peaceful calm, a blissful escape from my mind for one night. Or a complete flip, the drink being the key that unlocked thoughts from a box I forcibly close every day. Each drink is a game of Russian roulette, a time for bliss or the edge of a cliff, and all I can do is pray to a God that saw this all happen that it won’t send me down a spiral I’ve tried for three years to keep myself from. What I am left with is the sincerest hope that you are happy. That life has gone nowhere but up for you. I want you to be free. I want your life to be thrust forward into ecstasy. But I know I’ll break if I ever see your face again.